Erroneous modification of the mouse genome can lead to the generation of transgenic lines carrying non-functional alleles or unwanted mutations. These faulty models can seriously impact your research program, wasting resources on misleading results. Are Design Errors Driving Translational Failure? Genetically modified mouse models first appeared more than thirty years ago and are still at the heart of biomedical research. The first models carried relatively simple genetic modifications, such as gene deletions and random transgene insertions1. The range of models available to the research community rapidly expanded to include conditional knockout, conditional knockin, and humanized alleles2. Despite the initial enthusiasm of the scientific community, results obtained using transgenic lines would oftentimes not translate to clinical studies. This initiated the discussion if the use of mouse models in the development of new drugs should be reduced or even abandoned altogether3. Although failure to translate transgenic studies to the clinic might be caused by intrinsic biological differences between mice and men4, the 85% nucleotide identity in coding regions between the genomes of the two species indicates that most biological mechanisms are shared5. It is therefore likely that suboptimal experimental design6 or transgenic design projects involving poorly characterized or non-functional genetic modifications strongly contribute to translational failure. It is out of the scope of this article to describe best practices to design a preclinical study using animal models. We will focus instead on common errors leading to the generation and use of improperly modified transgenic mouse models. In-depth analysis of the target locus, careful design and sequencing of the targeting vector are the first crucial steps to generate a new transgenic line. Overlooking some characteristics of the targeted locus (e.g. miRNAs or regulatory sequences embedded in the target gene) might lead to detrimental deletion of functional genomic elements, resulting in phenotypes not correlated with the desired gene modification. This is a very serious concern, as many transgenic lines were generated before the sequence of the mouse genome was available and most functional genomic elements had not been mapped. Careful evaluation of the genomic structure of the target locus might not be sufficient if the vector for the generation of the transgenic line contains elements that negatively influence the functionality of the model. A good example is the use of the human growth hormone (hGH) sequence in the generation of multiple transgenic Cre recombinase lines7. Although the hGH sequence was thought to be non-functional and used only to stabilize the RNA transcript of the transgenes, it later turned out that it actually drives production of the human hormone and leads to observable phenotypes, basically invalidating most results obtained using these lines. Depending on the target locus, the design of the targeting vector, and the technology used, additional and undesired mutations can be inserted in the target locus with unexpected impacts on experimental results. A relatively common event is duplication of the target locus following standard gene targeting procedures8. Since duplication events are very difficult to identify with PCR or sequencing, they can evade the attention of researchers if the proper quality controls are not applied. The effect of locus duplication manifests itself as persistence of the wild-type alleles in the homozygous targeted configuration. Potentially, this might lead to the wrong conclusion about the effects of the modification of the targeted allele and to over-expression of the target gene caused by the duplication of the locus9. The phenotype of a transgenic model can be influenced by off-target mutations - additional and unwanted mutations introduced during genomic manipulation. The presence of potential off-target genetic mutations has been one of the major concerns for the use of the genome editing technology CRISPR/Cas9 in the generation of new mouse models10,11. Despite initial reports suggesting a lack of specificity in the CRISPR/Cas9 system, Taconic and others have observed very low levels of off-target modifications when using this technology (Taconic, unpublished observations)12,13, suggesting that CRISPR/Cas9 displays very little non-specific activity in the standard conditions used to modify the mouse genome. In any case, off-target mutations can be easily segregated from the target gene while breeding the transgenic colony. More troubling are off-target mutations introduced in the close proximity to the modified locus, since these are physically linked to the targeted allele and will therefore co-segregate with it during backcrossing. Two common sources of off-target mutations linked to the target locus are errors in cloning of targeting vectors (Taconic, unpublished data) and the use of ES cells with a different genetic background from the desired experimental model. As of a few years ago, the only ES cells available were derived from 129SvEv mice. Most genetically modified models were generated on that background15 and backcrossed to C57BL/6 for ten generations or more with the aim to exchange all genes. Variants linked to the targeted locus, however, will not segregate and might influence experimental results, leading to wrong assumptions about the function of targeted genes15,16. 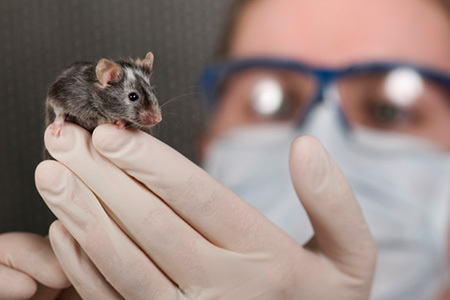 Researchers should take precautions to ensure that results obtained from the use of genetically modified mice are truly relevant to their research programs. When generating a new transgenic line, always ask experts in mouse molecular genetics to review your targeting strategy and the vectors that will be used to introduce the desired mutation. In many cases, issues similar to the hGH example presented here7 are not published, but only circulate word-of-mouth. One conversation with a mouse geneticist might save your transgenic design project. It is never worth it to skip quality control steps during the validation of the targeting events in order to gain a few weeks in the genome modification phase. Artifacts such as duplications or deletions at the target locus are very difficult to identify, sometimes becoming manifest only after the mouse line has been generated and bred for a few generations. When using an existing line of transgenic mouse models, it is paramount to review all available information about their generation and background of origin. It might be worth re-evaluating the original targeting strategy in light of the mouse genome sequence information currently available. 1. Palmiter RD, Brinster RL. Germ-line transformation of mice. (1986) Annu Rev Genet.;20:465-99. 2. Bouabe, H., & Okkenhaug, K. (2013). Gene Targeting in Mice: a Review. Methods in Molecular Biology (Clifton, N.J.), 1064, 315-336. 3. Mak, I. W., Evaniew, N., & Ghert, M. (2014). Lost in translation: animal models and clinical trials in cancer treatment. American Journal of Translational Research, 6(2), 114-118. 4. Special on Mouse Encode. 5. Vassilopoulos, S., Esk, C., Hoshino, S., Funke, B. H., Chen, C.-Y., Plocik, A. M., ... Brodsky, F. M. (2009). A Role for the CHC22 Clathrin Heavy Chain Isoform in Human Glucose Metabolism. Science (New York, N.Y.), 324(5931), 1192-1196. 6. Perrin S. Make Mouse Models Work. (2014) Nature 507(7493):423-425. 7. Brouwers B., Creemers JWM. (2015) Human Growth Hormone in Transgenesis: A Growing Problem? Diabetes, 64 (11) 3648-3650. 8. Mangerich A., Scherthan H., Diefenbach J., Kloz U., van der Hoeven F., Beneke S., Bürkle A. (2009) A caveat in mouse genetic engineering: ectopic gene targeting in ES cells by bidirectional extension of the homology arms of a gene replacement vector carrying human PARP-1. Transgenic Research 18, 2, pp. 261-279. 9. Bowman, A.B., Lam, Y.C., Jafar-Nejad, P., Chen, H.K., Richman, R., Samaco, R.C., Fryer, J.D., Kahle, J.J., Orr, H.T. and Zoghbi, H.Y. (2007). Duplication of Atxn1l suppresses SCA1 neuropathology by decreasing incorporation of polyglutamine-expanded ataxin-1 into native complexes. Nature genetics, 39(3), pp.373-379. 10. Yee, J. (2016). Off‐target effects of engineered nucleases. Febs Journal, 283(17), 3239-3248. 11. Zhang, X., Tee, L., Wang, X., Huang, Q., & Yang, S. (2015). Off-target Effects in CRISPR/Cas9-mediated Genome Engineering. Molecular Therapy. Nucleic Acids, 4(11). 12. Tan, E., Li, Y., Del Castillo Velasco‐Herrera, M., Yusa, K., & Bradley, A. (2015). Off‐target assessment of CRISPR‐Cas9 guiding RNAs in human iPS and mouse ES cells. genesis, 53(2), 225-236. 13. Nakajima, K., Kazuno, A. A., Kelsoe, J., Nakanishi, M., Takumi, T., & Kato, T. (2016). Exome sequencing in the knockin mice generated using the CRISPR/Cas system. Scientific Reports, 6. 14. Eisener-Dorman AF, Lawrence DA, Bolivar VJ. (2009) Cautionary insights on knockout mouse studies: the gene or not the gene? Brain Behav Immun. Mar;23(3):318-24. 15. Vanden Berghe T, Hulpiau P, Martens L, Vandenbroucke RE, Van Wonterghem E, Perry SW, Bruggeman I, Divert T, Choi SM, Vuylsteke M, Shestopalov VI, Libert C, Vandenabeele P. (2015) Passenger Mutations Confound Interpretation of All Genetically Modified Congenic Mice. Immunity. 21;43(1):200-9. 16. Broz, P., Ruby, T., Belhocine, K., Bouley, D. M., Kayagaki, N., Dixit, V. M., & Monack, D. M. (2012). Caspase-11 increases susceptibility to Salmonella infection in the absence of caspase-1. Nature, 490(7419), 288-291. Need additional help designing a model?